They Rescued This Itty Bitty Kitten, But Just Watch The Results… It’s ADORABLE. Kind humans rescued Ohagi, a very tiny kitten who could barely walk and nursed her back to health. She is growing up wonderfully and the rests of this rescue are just priceless! Little tiny Ohagi the kitten might be tiny, but she’ll steal your heart, she just that cute! Fluffy Little Kitten Rescued, But Now It’s Time To Learn To Eat… Omg, This Is VERY Messy, But CUTE! 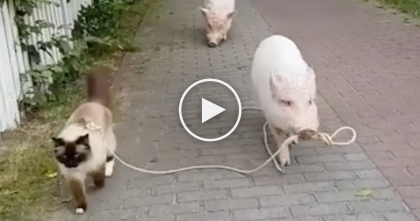 Kitty Goes For A Walk, But Keep Your Eye On The Pig… I’ve NEVER Seen Anything Like It, LOL!! 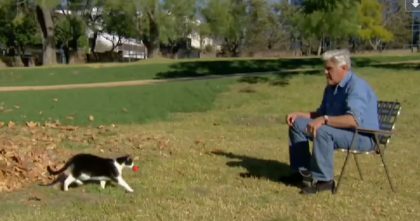 Every Time This Human Walks Forward, Just Watch What The Kitty Does…Oh My, This Is SOO Sweet!